I’ve been giving a lot of thought lately to what draws me to films so deeply. Or, more precisely, to certain specific films. It’s definitely the feelings those movies inspire in me but it also has to do with the life-changing aspect of a project. When I was a little girl, I remember watching some films and coming out of the theater with newfound excitement, and what I can only describe today as a refreshed joie-de-vivre. And even though I have grown a lot in years since those days, I still expect a movie to add an extra bounce to my step when I’m finished watching it. Which does not always mean it has to be about romance, roses and kittens. 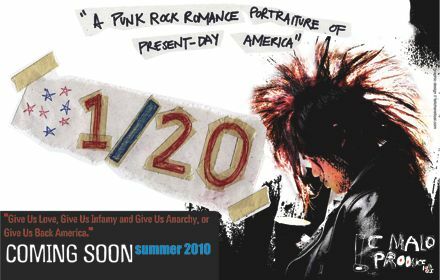 Rather, it can be a film like 1/20 -- A Punk Rock Romance Portraiture of Present-Day America, which shows a different way of looking at the close world around us and in the process inspires me to be better, do better. Marcel Proust wrote “The real voyage of discovery consists not in seeing new landscapes, but in having new eyes” and indeed, something as politically charged and media driven as the 2008 US Presidential election can also be seen as a romantic depiction of the people who drove Obama to the top post, the same generation which — within its Arab counterparts — is now also responsible for the newfound democracy efforts in Egypt. Whether the older generations want to admit it or not, these days politics, entertainment and fashion are all driven by those who know how to use Facebook and Twitter to their full potential. CNN, the New York Times and even some of the most notorious online news sites can’t possibly reach as many people as the communities of social networks that are available all over the world, in all different languages, for nearly everyone to use. It’s as if this already small enough world of ours got even tinier. We are all “friends” and we can choose to “like” a president, a film or a revolution with the click of our mouse. As a friend stated so simply and easily “we expected Obama to be like Michael Jordan, but he’s only done as well as a regular player on the Nets”, which is a great — albeit not the most P.C. way — to look at how much was expected of our first African American President, mostly because of all the online hype. While 1/20 The Movie finalizes the deals which will bring this “Film for the people, by the people” to its audiences later this year, I did catch up with three of the creative forces behind this project. Berwin, the producer and head of C Malo Producciones, Gerardo Del Castillo Ramirez the director and Bruno Zaffora, the assistant director of 1/20 The Movie all spoke to me via Skype, after 11 PM their time, from a street in Bon Pastor, a Gypsy/Arab neighborhood in Barcelona. It was the perfect setting, time, set of characters and conversation for a film that is just so interesting and fresh, it CAN’T be overlooked. The film’s creative forces give the synopsis of the film as follows “We are the 1/20 generation, and we have run away from our teachers. 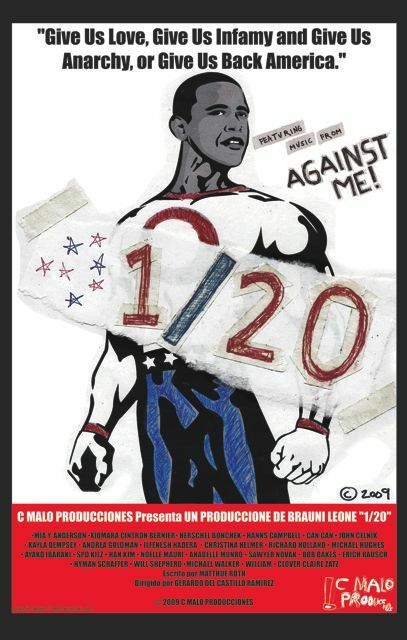 1/20 is a punk rock romance portraiture of present day America. This teen/coming-of-age film utilizes iconic American imagery to examine the people’s reaction to the campaign and inauguration of Barack Obama. On 9/11 part of America died, but on 1/20 it was reborn. Six iconic American characters from the 1/20 generation converge on Washington DC the night before the inauguration of Barack Obama. Their experiences reflect the zeitgeist of our times, and we learn that politics are less valuable than friendships and love conquers all. I asked Gerri how did the film “begin” — come about if you will. He answered “Berwin wanted to do something political, he met Matthue Roth — a young novelist from NYC known for depicting this 1/20 generation — and then contacted me to direct it. We are pretty lucky guys that we are all connected in this work.” Berwin added that “Art Basel in December 2008, after the election, had a significant presence of art featuring Obama and the Inauguration which was the initial inspiration for the project”. And if the film seems like a documentary type of project it’s not, it’s actually “all fiction and fully scripted. There are some parts that are documentary, but the setting is fiction. We tried to get a screenplay from someone who is actually a part of this generation and Matthue is also very interested in multicultural ideas.” Gerri continued. The absolute essence of the film lies in this anecdote Bruno shared at the end of our talk “last night, a few of us sat in an apartment here in Bon Pastor, without heat and hot water, watching the theatrical version of the film on a laptop owned by C Malo Producciones because that’s what we have, in keeping with the spirit of the film.” The spirit of 1/20 The Movie, a film on a journey that has just begun and definitely one to watch! This entry was posted on Tuesday, February 15th, 2011 at 2:32 pm and is filed under Films 2 See, Interviews, Trailers - @ 1st Impression?. A great first post ( at least first I have read) Will be looking forward to the movie) I loved the energy in the clip. Excellent post, Nina. Everyone has a romantic side, some keep it hidden and some like me , flaunt it, but the most important thing in this world is love. Love for the soul-mate, parent, friends, dog, writing or movies. We all love and your post proves my point. Will definitely watch the movie.